Here are my cultists for Strange Aeons, etc. They’re from Artizan except for the high priest which is from Vesper-on. It’s a bit taller than the Artizan figs, however his features are proportional so I feel he works well. Based loosely on a tutorial that I received from a friend (I would give credit to the original author, however it came from a restricted forum that I do not belong to) I scratch built these palm trees, stands and oasis. The trees were made using brown pipe cleaners and brown floral tape for the trunks, and the fronds are from a plastic faux plant from the craft store. Basically I folded the pipe cleaner in half, inserted the fronds in the loop created by the fold, and then twisted the pipe cleaner down it’s length to hold them in place. Then I wrapped the trunks with brown floral tape, from the bottom up, to create texture. I dry brushed the trunks with some light tan, and then mounted a magnet on the bottom of the trunks. I magnetized the trees to facilitate storage. I cut out the bases from scrap MDF and fashioned the “humps” from Sculpey. The rocks were made from Sculpey that was pressed into Woodland Scenics rock molds. The clay shapes were baked and then glued to the bases, then the bases were coated with beach sand. At this point I drilled holes to mount the magnets where the trees would stand. The bases were primed and dry brushed with various colors, then flock, broken trunks, and fallen fronds were added. The snake and lizard were sculpted from clay, and my son picked the paint colors for them. The oasis was created in the same fashion. 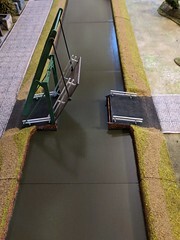 The base below the water was painted with gradients of ochre, and the water was created using several pours of Woodland Scenics Realistic Water tinted with blue and green artist’s inks. 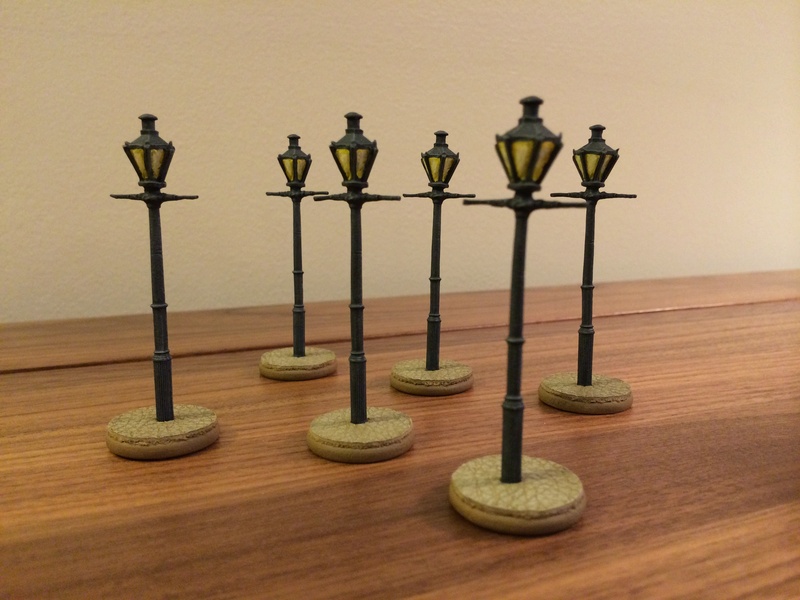 I finished off my street lamps that I received from Grand Manner (years ago) when I ordered my Carentan buildings. 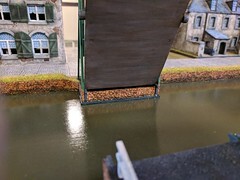 I mounted them on wooden discs from the craft store that I covered with the same faux leather that I use for my cobblestone gaming mat.